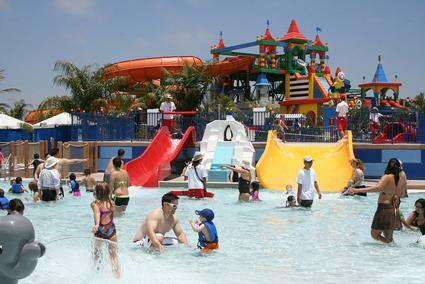 The best way to beat the heat during the daytime is in the water, and this is really easy to do if you're visiting a LEGOLAND the park that also has a water park. Water parks in general are great places for fun in the sun, but when you add in the creative design of LEGO blocks paired with water park rides, it's truly a unique experience. As of 2015, three of the LEGOLAND theme parks - the ones in Florida, California and Malaysia - have dedicated water parks. The LEGOLAND Water Park in Florida is part of the LEGOLAND Florida Resort in Winter Haven, which is roughly half-way between Tampa and Orlando. 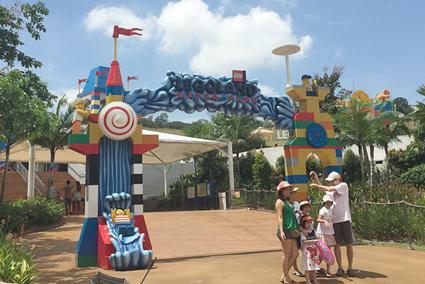 Admission to this LEGOLAND water park is open only to those who are visiting the theme park. The resort, including the water park and the theme park, is geared toward young children. A TripAdvisor reviewer indicates that the resort its perfect for toddlers and kids up to 12 years old, but is also entertaining enough to keep the adults happy. There is a 60-foot water slide for the more adventurous guests, as well as the Duplo Safari area, designed for those six years old and younger. Other cool attractions include the 1000-foot long wave pool, Joker Soaker Water Playhouse and a Wave Pool. Visiting LEGOLAND Florida Water Park is a great family vacation option. A review on the Have Baby Will Travel blog indicates that you can't do both the theme park and the water park in the same day, so you may want to schedule multiple days to make the most of your LEGOLAND experience. One potential downside is that the rides are affected by weather conditions, and could be closed for an entire day for visitors' safety as noted by a reviewer on TripAdvisor. With Florida falling under the Atlantic hurricane season, be sure to factor the time of year into your travel plans. Combination admission to the LEGOLAND Florida water park is $104 for visitors ages 13 and older $97 for those ages 3 - 12, and under 3 is $3. This includes a one day admission to both parks. It's cheaper if you purchase on the LEGOLAND website two or more days in advance. There are also season passes available starting at $119, which grants unlimited entrance to both the LEGOLAND Park and the water park. Look for more discount tickets on sites like Best of Orlando. 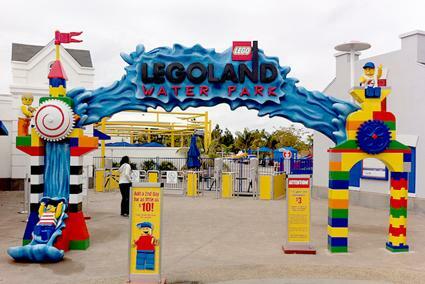 LEGOLAND California is located in Carlsbad, near San Diego. The theme park is nearly 130 acres and has a water park section known as Pirate Shores, as well as a dedicated separate water park called LEGO Legends of CHIMA Water Park. As with other LEGOLAND parks, it is focused on the interests of young kids, but there are options for everyone in the family. The Legends of CHIMA Water Park features characters from the popular children's television program. Crooler's Twist and Lion Temple Wave Pool are designed for visitors 40" and 42" and taller respectively. Crag's Run and Crug's Run are for visitors 36" or taller. All other attractions in the CHIMA water park have no height requirements. Build-A-Raft River is where visitors can make custom LEGO add-ons to their raft before they go floating down the lazy river. Orange Rush is a family raft slide holding a maximum of four people that careens down a 312 foot slide. Twin Chasers are two side-by-side slides that you race down, ultimately emptying into a wading pool. 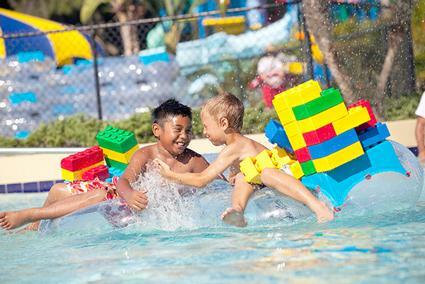 A review on TripAdvisor notes that the LEGOLAND Water Park in California is more appropriate for children from toddlers to 9 years old, suggesting that it is "amazing" for toddlers, but that it's not appropriate for children under two years old. According to a Yelp reviewer, the water park is really small. The reviewer indicates that you can experience most rides in a few hours. While this may be a drawback for some, it could be a positive if you don't want to spend an entire day at the water park. A 1-day Water Park Hopper includes admission to both LEGOLAND and LEGOLAND Water Park. Prices are $110 for adults 13 and over, and $104 for children ages 3-12. Children ages 1-2 are $5. The LEGOLAND Water Park in Malaysia is hailed as the largest water park of all the LEGOLAND water parks with over 20 slides and more than 70 LEGO models. LEGOLAND Malaysia is located at Nusajaya, Johor, Malaysia. Unlike the two U.S. parks, admission to this park can be purchased separately from the theme park. The park appeals primarily to toddlers and young children, but there are options that older kids and grown-ups will enjoy. The Joker Soaker, which is an interactive playground equipped with water buckets, water cannons and a variety of slides designed for family entertainment, is not-to-miss attraction at this park. The slides have minimum height requirements starting about 36 inches (.91 m), but the other parts of the attraction are open to all. Slide Racer are five slides side-by-side where you race against your fellow sliders. Wave Rider is a 240 foot open-tube body slide, great for getting the thrills started. Tidal Tube is a 240 foot enclosed body slide. Brick Blaster is where you get to slide through two tunnels with two or three friends. Splash 'N' Swirl is a slide where you can go alone or along with a friend to share the excitement. Twin Chaser are two side by side 130 foot tube slides. Red Rush is a 312 foot long and 11 foot wide family slide that can fit up to 6 people in the slide. Make sure to pay attention to the dress code which states no cotton t-shirts, exposed zippers, wetsuits, water shoes, or any loose articles that could get damaged during a ride, like hats or sunglasses. Swim diapers are required for children 3 and under. Because of Malaysia's tropical climate and regular thunderstorms, outdoor attractions may be closed for guests' safety. Storms generally occur in the afternoon and evenings, allot this time for indoor attractions, souvenir shopping, or an early dinner. Visitors to this water park point out that there are not enough shaded areas. The park is new and many of the trees have not grown to full size yet. This leaves you directly under the heat of the tropical sun, and thus cabana rentals are highly recommended. Entrance to LEGOLAND Malaysia's water park only is $97 Malaysian Ringgit (approximately $22 USD, depending on the exchange rate) for visitors 13 and over, and 81 Malaysian Ringgit (approximately $18 USD) for visitors ages 3 - 12 and seniors 65 and over. Combo tickets for the water park and theme park are also available. The fact that you can enter water park without entering the theme park is a plus if you are looking strictly for water entertainment. As with any water park, there are some general tips to keep in mind to maximize your day. Get there about 30 minutes before the water parks open so you'll be one of the first visitors in the gate. The Duplo Safari area at each park is designed for toddlers, so plan to spend quite a bit of time there if you have very young kids. Don't forget sunscreen and an approved bathing suit. Consider eating lunch before noon to avoid some of the crowds. Look for online discounts when purchasing tickets in advance from the LEGOLAND website. If your kids are picky eaters, be sure to check food menus ahead of time. You'll find that food varies by park and, in predominantly Muslim countries like Malaysia, don't expect to find pork on the menu. If you are spending all day at the water park, consider renting a cabana to ensure you have a covered area to relax when the sun gets too hot. LEGOLAND water parks are a great way to include family fun on both your domestic and international travels. With each park being a little different, finding your favorite one is part of the fun of building dreams, which is what LEGO stands for.